With the door open unscrew the retaining screws. You'll usually find there's a metal cover screwed to the mortice lock which will come away as you unscrew with some more screws underneath holding the actual lock in place. With the screws out carefully prise out the lock. This will be quite a snug fit so you may find it a little tricky but it will come out. Tip You may have trouble getting the lock out especially if it's been over painted or varnished. With the door ajar lock the mortice. Then use some mole grips to grip onto sticking out bit and pull. If it has been painted over score round its edges with a stanley knife first. 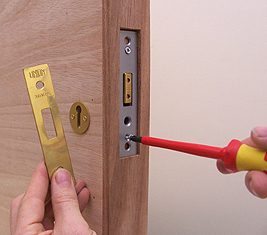 There are loads of different types and sizes or mortice lock. It is important to take the old one with you to match it exactly with a new one. If you take it to a decent lock shop they should have no trouble matching it. If you don't match it perfectly the new one may not fit and you may have to make adjustments to the door with a chisel, or, the key make not fit in properly. Far easier to get an exact match, then the new one simply slides in and re-screws. Tip Some mortice locks are expensive especially if it's a 5 lever security type(usually found on front doors). 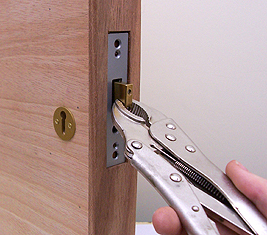 If you are changing the mortice simply because you have lost the keys take the mortice lock to a proper locksmith rather than a shop that sells locks as they will usually be able to simply make you new keys from that lock so you quite a bit of money.